Need a good topic to write about? Look no further! Illustration by Melissa Ling. ThoughtCo. If getting started is the hardest part of the writing process, close behind it (and closely related to it) may be the challenge of finding a ​good topic to write about. Of course, sometimes an instructor will solve that problem for you by assigning a topic. But at other times you'll have the opportunity to choose a topic on your own. And you really should think of it as an opportunity—a chance to write about something you care about and know well. So relax. Don't worry if a great topic doesn't immediately spring to mind. Be ready to play with a number of ideas until you settle on one that truly interests you. To help get you thinking, we've prepared some writing suggestions—more than 400 of them, in fact. But they are only suggestions. Along with some freewriting and brainstorming (and maybe a good long walk), they should inspire you to come up with plenty of fresh ideas of your own. 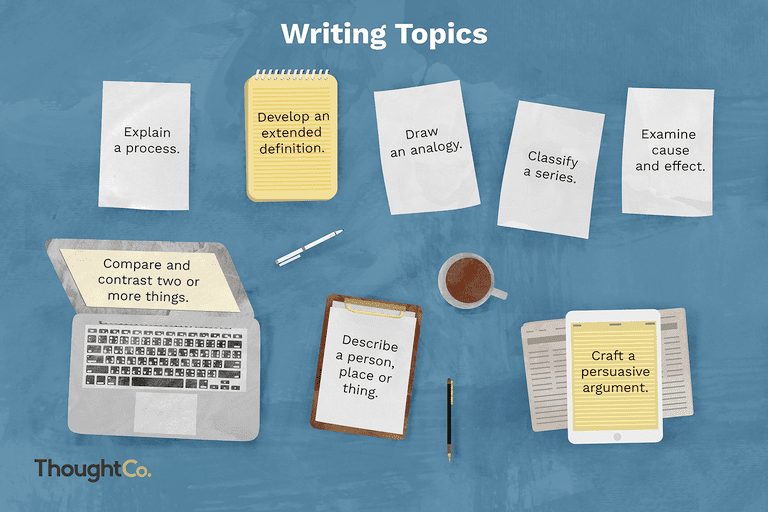 We've organized the suggested topics into 11 broad categories, loosely based on some of the common ways of developing paragraphs and essays. But don't feel limited by these categories. You'll find that many of the topics can be adapted to suit almost any kind of writing assignment. Now follow the links to our 400 topic suggestions and see where they take you. Describing People, Places, and Things: 40 Writing Topics: Descriptive writing calls for close attention to details—details of sight and sound, sometimes even of smell, touch, and taste. We've come up with 40 topic suggestions for a descriptive paragraph or essay. It shouldn't take you long to discover at least 40 more on your own. Narrating Events: 50 Writing Topics: Another word for "narration" is "storytelling"—though often the stories we tell actually happened. Narratives can serve to illustrate an idea, report an experience, explain a problem, argue a point, or simply entertain our readers. Here are 50 ideas for a narrative paragraph or essay. But don't feel that you have to tell one of our stories—not when you have so many of your own tales to tell. Comparing and Contrasting: 40 Writing Topics: Think about the last time you had to make a decision: right there is a topic for comparison and contrast. And right here you'll find 40 more ideas that might be explored in a composition developed by comparison and contrast. ::Classifying and Dividing: 50 Writing Topics: Are you ready to get organized? If so, you'll probably be applying the principle of classification—perhaps to one of our 50 topics or to a brand new topic of your own. Examining Causes and Effects: 50 Writing Topics: We can't tell you exactly what causes global warming, but maybe you can tell us. If not, these 50 other topic suggestions should start you thinking about "why?" and "so what?" Developing Extended Definitions: 60 Writing Topics: Abstract and controversial ideas can often be clarified through extended definitions. The 60 concepts listed here can be defined in various ways and from different points of view. Arguing and Persuading: 40 Writing Topics: These 40 statements may be either defended or attacked in an argument essay. But you don't have to depend on our suggestions: let's see what issues really matter to you. Composing a Persuasive Essay or Speech: 30 Writing Topics: Any one of these 30 issues may serve as the basis for a persuasive essay or speech.